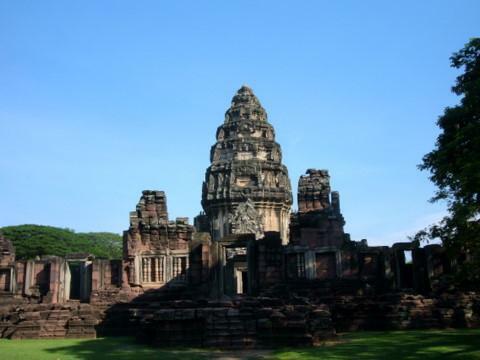 The Bangkok Travelbug celebrates its 2nd anniversary with a visit to Phimai in Nakhon Ratchasima, or Korat for short. 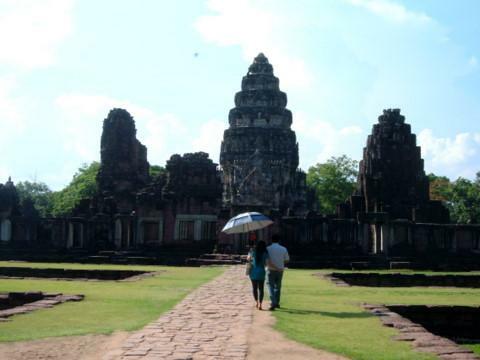 Phimai, about 300 km from Bangkok, is famous for the Phimai Historical Park or Prasart Hin Phimai, an 11th century temple complex that was part of the Angkor or Khmer Empire. 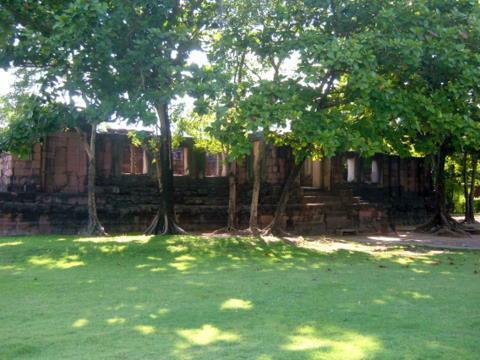 This temple which houses a sacred relic in an inner sanctuary is part of the Cultural Route linking Angkor to several parts of north-eastern Thailand. 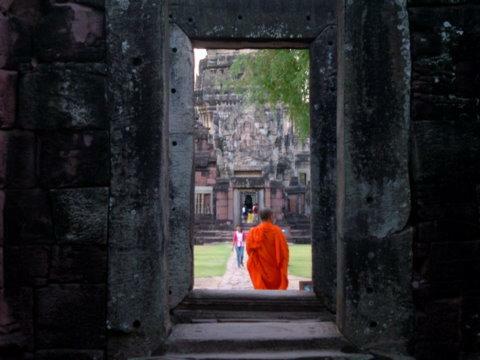 In 802 AD King Jayavarman II established his kingdom in Angkor in present day Siem Reap in Cambodia just north of the Tonle Sap Lake in the areas inhabited by the Khmer. 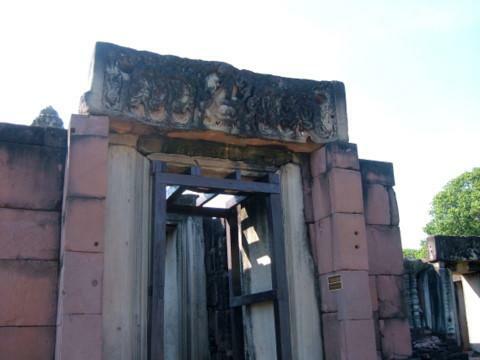 Evidence of Khmer influence is also present in Kanchanaburi, where the old ruins of Muang Singh are likely to be the outpost of this vast empire. 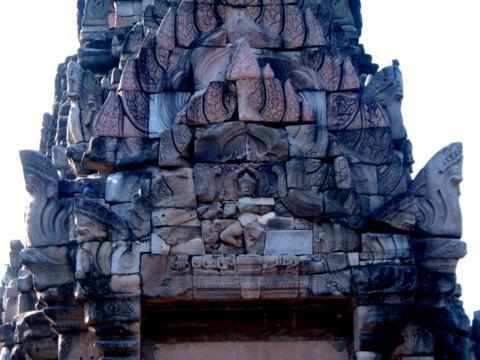 The Khmer civilization was noted for its unique architecture, sculpture, intricate irrigation systems and roads. Constant wars with her neighbours around the 13th century gradually sapped the empire’s strength. 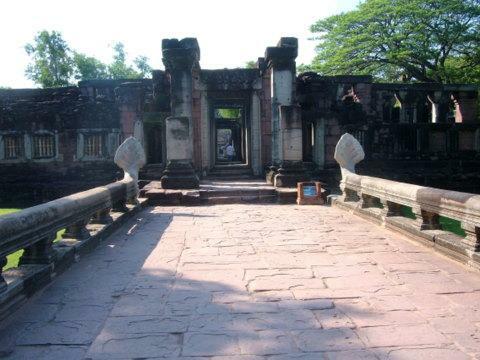 In 1431 Angkor was sacked by the Siamese, the capital was moved to Phnom Penh and the empire went into decline. 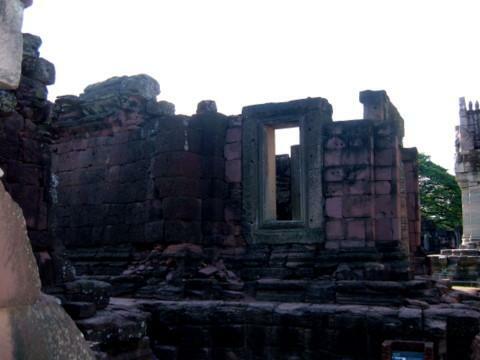 But the influence of the Khmer civilization remains to this day in north-eastern and central Thailand as seen in the architecture and the old ruins of some of the temples. At the peak of the Angkor Empire, there was a route linking Angkor to north-eastern Thailand through a pass in the Dongrak Mountains which separate Thailand and Cambodia. 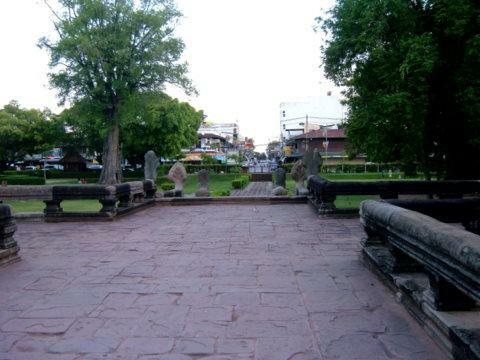 The route passes through the mountain range into present day Buriram and Nakhon Ratchasima (Korat). 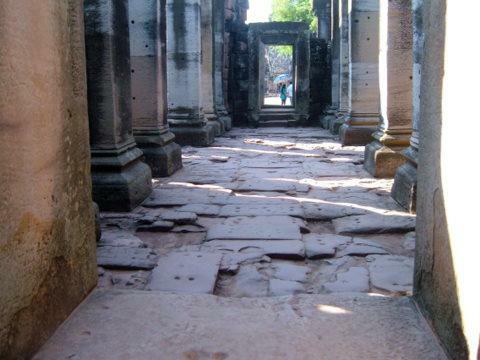 Pilgrims and travellers used this route frequently and the Angkor kings built rest houses, hospitals and the finest temples and monuments. 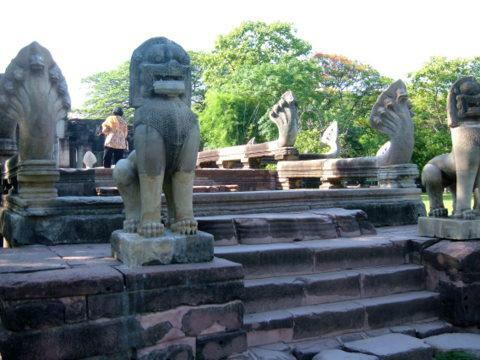 Some of these monuments include Muang Tam and Prasart Phanom Rung in Buriram and Prasart Hin Phimai in Nakhon Ratchasima (Korat). 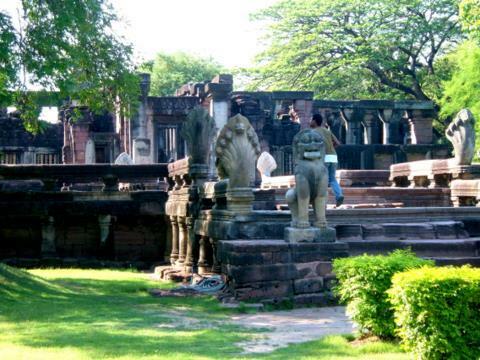 Phimai is a district in the north-eastern province of Nakhon Ratchasima (Korat) and Phimai, the main town in this district is 60 km north-east of Nakhon Ratchasima city, the provincial capital. 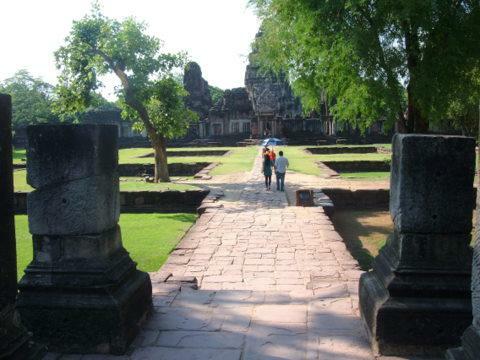 Phimai is famous for the ancient ruins of a temple complex, Prasart Hin Phimai or the Phimai Historical Park. This Khmer temple was constructed from 11 – 13th centuries on the banks of the Mun River which runs through the Korat Plateau before joining the Mekong River in Ubon Ratchathani to the east. Unlike the other Khmer temples which are Hindu, Prasart Hin Phimai is a Mahayana Buddhist temple. It also faces Angkor to the south-east whereas other Khmer temples face east. 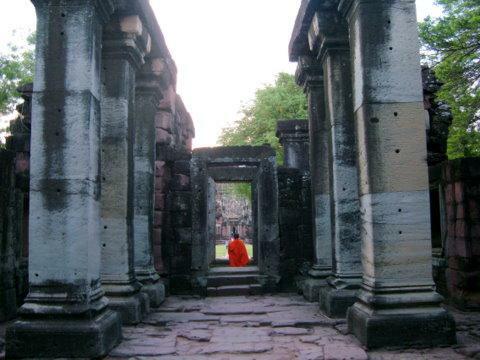 Prasart (abode of the gods) Hin (stone) Phimai was designated a cultural heritage in 1936. Restoration work on these ancient ruins took place from 1964 - 1969 as part of a joint effort between the French and Thai governments. The park officially opened on 12 April 1989. Entrance to the historical park is through the south gate. Stop at the visitors’ centre to get an overview of the historical park and also a brochure in English which will serve as a useful guide in your tour of the complex. 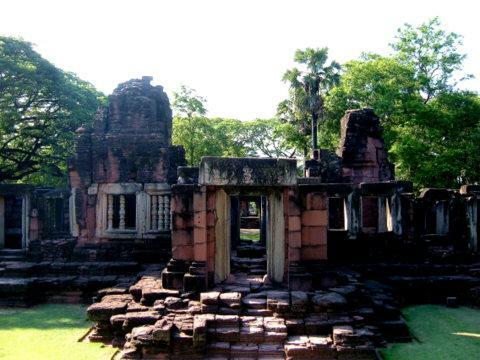 Prasart Phimai is a rectangular structure approximately one km from north to south and 0.6 km from east to west. The complex consists of two concentric rectangular walls, four arched gateways, one on each side of the outer wall and another four arched gateways on each side the inner walls in a symmetrical layout. Let’s take a tour of this ancient temple complex. I was about to enter the main sanctuary when I noticed these ruins to the west. The building, called Phlab Phla, is located outside the main temple as it’s a pavilion for royals to dress up before entering the temple for religious ceremonies. A quick exploration of the interior gave me an idea of what to expect in the rest of the complex. Next we start our tour of the temple complex proper by crossing the Naga Bridge. This wide stairway, lined on both sides by seven-headed Naga serpents, leads to the arched gateway in the first wall. The bridge is the start point of the journey to the sacred inner temple and also signifies the link between Heaven and Earth in Hindu and Mahayana Buddhist beliefs. 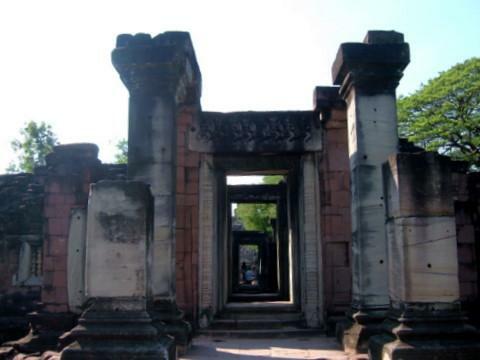 Once across the Naga Bridge we arrive at the arched gateways at the outer wall (Kamphaeng Kaew) with a sculptured stone lintel over the doorway. The arched gateway is formed by several pillars and it leads to the courtyard between the outer and inner walls. After passing the outer wall, we enter a spacious courtyard with a passage way. 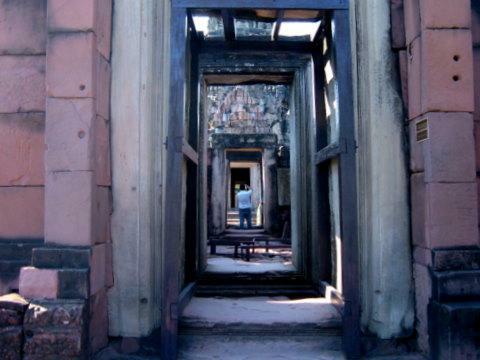 This passage links the outer wall to the inner wall around the sacred temple. 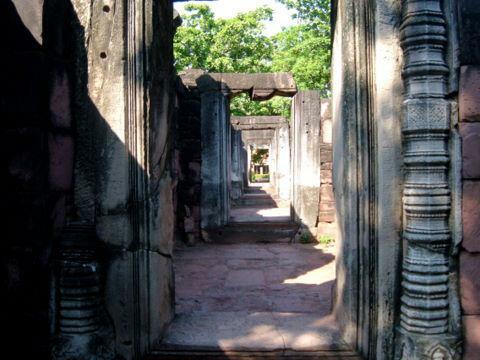 We arrive at the second wall where arched gateways lead to the sacred sanctuary within. 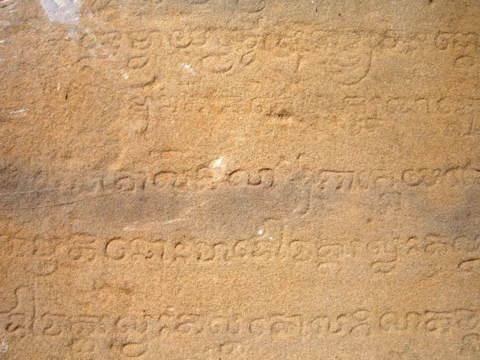 One of the pillars in this arched gateway has Khmer script engraved on it. We now enter the inner courtyard to view the most important building in the whole complex, Prasart Prathan or the Principal Tower. 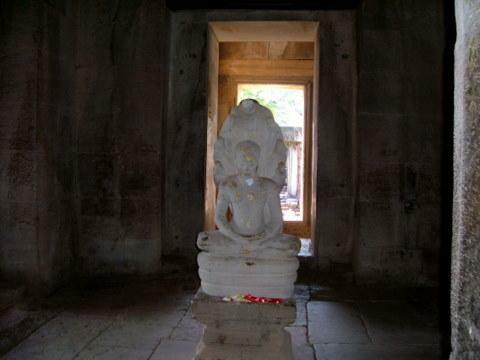 A set of aligned arched ways leads to the inner room which houses a sacred statue. 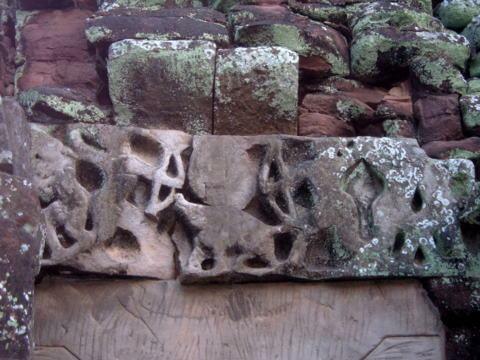 Having seen this complex, there are some salient features to note about Khmer designs. A Naga Bridge or the stairway lined by Naga serpents serves as the entrance to the temple. The temple is surrounded by concentric walls with arched gateways leading through. 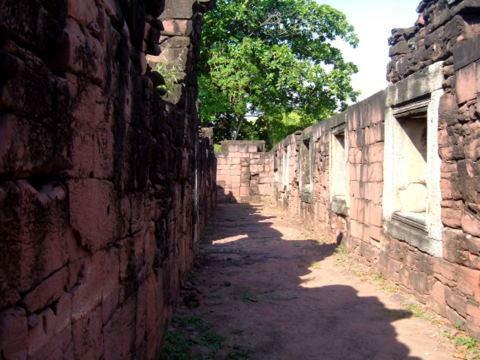 Multiple gateways through the entire complex are perfectly aligned, in the case of Prasat Hin Phimai, in a NW - SE direction. 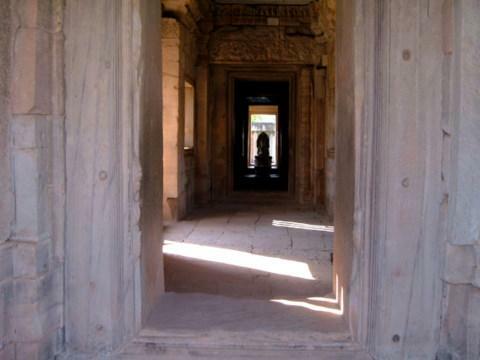 This photo clearly shows the alignment of the doorways from the outer wall right through to the inner sanctuary. There are elaborate sculptures on the walls and lintels over doorways. 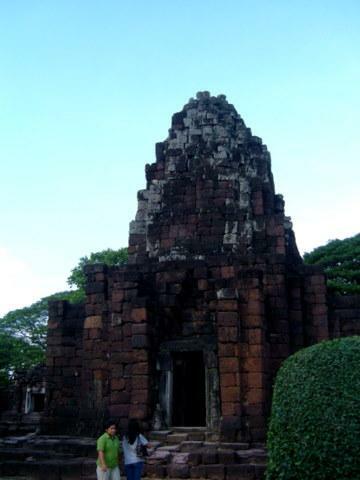 This lintel is above the northern door of Prang Hin Daeng (Red Stone Tower). 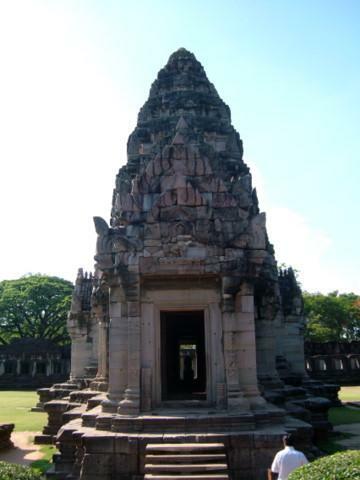 Prasart Phanom Rung, another ancient Khmer temple in Buriram which I visited in 2001, has similar features. There are three other structures to the south-west and south-east of the Principal Tower that are worth noting. 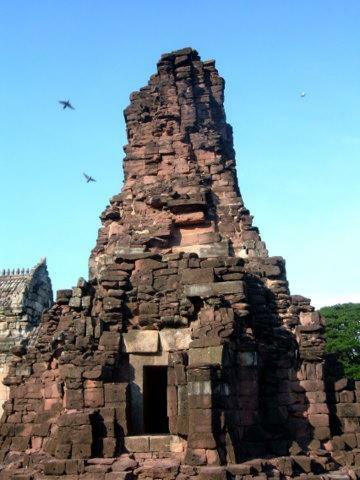 Ho Brahm, the ruins to the south-west of the Principal Tower, is believed to be a place to store Holy Scriptures. We end our journey by leaving the way we came, through the Naga Bridge, the stairway back to earth. I wonder what it must have been like a thousand years ago, as pilgrims trekked along this long mountain road, journeying from sanctuary to sanctuary, on their religious quest. Pilgrim, Pilgrim, what do you see? There’s a direct bus from Mor Chit station in Bangkok to Phimai (186 baht). I thought this was convenient. I was wrong! This bus made several stops to pick up passengers and for breaks as it doesn’t have a toilet on board. The journey took more than six hours! On the return trip, I boarded the provincial bus from Phimai town to Korat bus station (36 baht). It took an hour and a half. The ride from Korat back to Bangkok was a breeze, an express tour bus that took a little over three hours. It cost 198 baht with a soft drink, cake, water, cold towel and an onboard movie “The Mummy” thrown in. The journey took a total of four and a half hours. 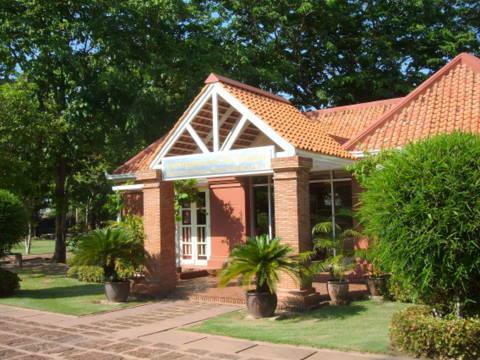 The entrance fees to Prasart Hin Phimai are 100 baht per head. Please forward this ezine to a friend if you enjoyed reading it. If you received this from a friend, please subscribe at Bangkok Travelbug. What you think of the Bangkok Travelbug?